Level is lightweight, very durable with a flat base for surface leveling. Accurate with a clear 360 degree vial. Aluminum construction is lightweight and durable with flat base for surface leveling. Special hang hooks grip line which enables level to slide freely for positioning; 360 degree vial for easy readability. Easy to read vials. Durable open hooks to slide on the line. Aluminum construction. Line level allows you to level and layout string and can be used on chalk reels to snap a level line. 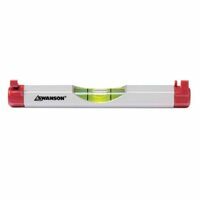 Swanson Line Level, Heavy Duty, 0.6 in/50 ft Accuracy, 4 in Length, 1 Vials, Aluminum, Silver, For Use on Pipe or Conduit Weatherproof poly vinyl chloride for harsh outdoor conditions. Bright, fade-resistant color for maximum visibility. Constructed of non-adhesive, non conducting vinyl. Used in applications such as construction, landscaping, excavating, identification of trees or hazards, and locating underground cables or pipe. 1-3/16" wide, 2 mil thick. Weatherproof poly vinyl chloride for harsh outdoor conditions. Bright, fade-resistant color for maximum visibility. Constructed of non-adhesive, non conducting vinyl. Used in applications such as construction, landscaping, excavating, identification of trees or hazards, and locating underground cables or pipe. 1-3/16" wide, 2 mil thick. Functions as a torpedo level and angle finder. It has many of the same features as the one and only Speed Square, but is constructed of lightweight high-impact composite. Center line guide for locating center of round stock, bulit in block level that is easy to read from all angles, and a beveled edge for ease of reading. Durable level vial is impact resistant. 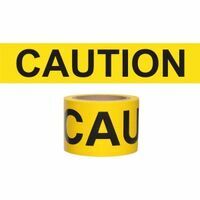 Lightweight construction reduces line sag. Unrestricted hooks allows for easy movement on line. Used for masonry, landscape and sheet metal work. Model 595 features "Multi-Pitch" vial reads slope in 1/8" increments. High impact ABS plastic. Easy to read vial. Durable open hooks to slide on the line. Allows you to level and layout string and can be used on chalk reels to snap a level line. Designed to provide multi-directional leveling. Durable, molded frame. Easy to read. 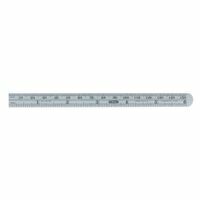 General Tools Precision Rule, Flexible, 6 in Length, 1/4 in Width, Graduations: 32nd, 64th, Ultra Fine Black Markings, Stainless Steel, Polished Lightweight, contour grip, Hi-Viz orange case is easy to find and fits comfortably in hand. Slide lock design allows for easy control of tape blade, wide base helps keep tape standing upright, removable belt clip and easy-to-read yellow clad blade (not replaceable). Provides dependable detection of wall studs. Magnet works by locating steel nails and screws used to hold drywall to studs. Base of the stud finder is notched for convenient marking once studs are located. 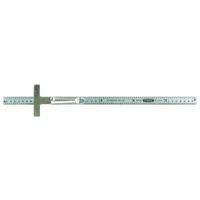 General Tools Precision Rule, Flexible, 6 in Length, 15/32 in Width, Graduations: 1 mm, 16th, Ultra Fine Black Markings, Stainless Steel, Polished High impact frame is non-conductive and non-corrosive with V-groove edge fits on pipe and conduit. Magnetic edge holds to ferrous metal surfaces (model 7500M). High visibility on job site (models 7500-ORANGE). Heavy duty brass flush mounted thumbscrews. Used for repeat angle cuts for stairs and rafters. Attaches to all standard framing and carpenter squares. Manufactured of high-grade, tempered aluminum and silver anodized for long life. Graduations are screen-printed on one side with black, thermal-bonded epoxy ink. Graduations-1/8'', 1/16''. Stainless steel with depth gauge pocket clip. 32nds and 64ths on one side, decimal equivalents on reverse. 15/32" wide. 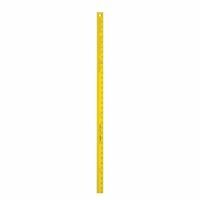 Swanson Yard Stick, 36 in Length, 1-1/4 in Width, SAE Measuring System, Black Thermo Bonded Markings, Aluminum, Powder Painted, Yellow Swanson Barricade Tape, Disposable, 3 in Width, 200 ft Length, 2 mil Thickness, Legend: CAUTION, Wet Paint Yellow Background, Black Legend, Polyethylene, For Marking Danger Areas and Special Instructions Lightweight construction minimizes line sag. Unbendable open hooks allow level to slide freely. Pocket clip will guard tool against loss. This 9 inch Toolbox level has 3 easy to read vials (horizontal, vertical and 45 degree) with a V-Groove conduit and magnetic base making it handy for any simple leveling jobs around the home or office environment; a must for those everyday tasks. High impact frame is non-conductive and non-corrosive with V-groove edge fits on pipe and conduit. Magnetic edge holds to ferrous metal surfaces (model 7500M). High visibility on job site (models 7500-ORANGE). High-impact body with V-Groove edge that fits on pipe and conduit and durable acrylic vial reads level. Strong magnetic pickup tip and metal pocket clip. Lightweight, durable aluminum hexagonal body construction reduces line sag. Unrestricted hooks allow for easy movement. Used for masonry, landscape and sheet metal work. For locating and transferring any angle from 0 degree to 360 degrees. Heavy duty adjustable stainless steel blade will not rust or corrode, a recessed grip in the handle. Easy-to-use wing nut for positive blade lock. Easy attachment to any rafter square. Use for angle cuts on rafters, or stair stringers. 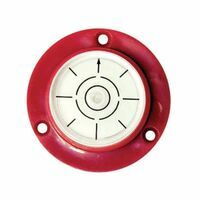 Can also be used as security stops on window or door metal channels.